Villa Sanann stands on a quiet and peaceful hillside overlooking the village of Kalkan. This villa is the perfect spot for anyone wanting a peaceful holiday with their own pool, a rooftop terrace and barbeque. Inside, the villa has three bedrooms with beautiful wooden floors and ample wardrobe space and access to balconies. Six sun loungers are provided on the pool terrace for you to soak up the sun, or alternatively there are small chairs and a coffee table and also big comfy chairs to relax and read or have a snooze. On the top balcony there is comfy seating to have your morning coffee or, in the evening, share a bottle of wine and watch the spectacular Kalkan sunset. Only a 10 minute walk down to the village and beach and all the amenities the sophisticated village of Kalkan offers, particularly in the evening when Kalkan springs to life with dozens of restaurants and shops. Wi-Fi available. Les and Sandra live in England. Les and I visited Kalkan sixteen years ago and fell in love with the village and we bought the villa together the following year. We holiday there at least three times a year and we feel it is our second home. A little bit of us always remains in Kalkan. There is so much to see and do in Kalkan and the surrounding area, you can have a relaxing holiday by the pool, or explore the breathtaking mountains and beautiful beaches surrounding Kalkan. There are also so many activities such as diving and other water sports and paragliding. We provide beach towels to cut down on luggage weight, and a welcome pack. We take on board guests' suggestions for any additions to the kitchen etc., and are constantly updating the villa, both inside and out. En-suite to bedrooms 1 and 2 with shower, WC (incorporating bidet) and hand basin. WC (incorporating bidet) and wash basin to bedroom 3. Cloakroom with WC (incorporating bidet). New in 2019 - fully fitted kitchen, including, hob, oven, fridge/freezer, toaster, juicer, washing machine, dishwasher, iron and board. Notes on accommodation: We would appreciate if guests would refrain from smoking in the villa. Outside: Outside, the villa stands in its own private garden with a large barbecue and private car parking. The villa also has a private pool, cleaned daily. There is ample room for sunbathing, either on the poolside terrace or on the roof terrace, where there is comfy seating for relaxing. Cleaning / Towels / Linen / Maid service: All hand/bath towels and bed linen are provided. Beach towels are also provided. The property is cleaned and beds changed twice a week. Other: Dining area with dining table and dining chairs. Very last minute booking but Sandra was the perfect host along with Gareth. Good location, clean, spacious, rooftop with a great view and well appointed for home cooking. Worth getting a car if you intend on visiting surrounding beaches like we did (there is a driveway). The beach 20 minutes south of Kaputas beach is always less busy and less windy so worth a visit. Great selection of restaurants in town. Would definitely come back to stay in this villa. So pleased you had an enjoyable holiday. This was the most relaxing holiday our family have had. We all absolutely loved it. Villa Sanaan does exactly what it says on the tin. It is clean, comfortable and Sandra is very good at ensuring everything goes smoothly. She kindly arranged our transfer and provided very good local knowledge and during the stay, she was on hand to provide support if needed. The villa is kept very clean and tidy, well presented and on our arrival, stocked with immediate necessities such as water, tea, coffee etc. During our stay the pool and grounds were cleaned thoroughly on a daily basis. The pool is a good size and the whole place was for us, pure relaxation. The villa is situated on a steep hill overlooking Kalkan and this affords fabulous views, particularly from the highest veranda. For the infirm or disabled the hill may be an issue and you would probably need to hire a car. For our family it was an easy 10 minute walk into town. The walk back is not so easy because of the gradient and although we did walk back occasionally, most people will want to get a taxi back to the villa. Taxi from the town to the Villa cost us about £4 with the tip. When we come to Kalkan next year we will hire a car. On this occasion we hired a scooter, which was great fun and ridiculously cheap. Kalkan, if you have not been before, is an absolute delight. Our family have had 6 holidays in Turkey and stayed in 5 different locations. Kalkan is by a Country mile, the most gorgeous. The first thing we noticed is how relaxed it is compared to other locations. But wait till you find the old town: it is absolutely rammed with cafes, bars and restaurants each of which is stylish and stylistically different. The service is, as always in Turkey, terrific and the food in every restaurant we ate, of a high standard. To be honest we did not do much on our holiday this year. We didn’t need to. We just soaked up the lovely atmosphere. But there are lots of things to do. In the second week we ventured to visit the beach clubs dotted around about and they are well worth a visit. Next year we plan to be more active. And we have no doubt we will be coming back next year. This was a wonderful holiday for our family and I want to thank Sandra and Gareth who was also there with help and advice. The villa is in a great location and Sandra is very easy to communicate with. Without hesitation we would recommend this villa and if you have not been to Kalkan before, it will not disappoint. So glad you enjoyed your holiday in Kalkan and Villa Sanann, and thank you for your kind comments. 4.5 stars - Lovely spacious villa with a very generous pool - better than advertised! We have just returned from a 2 week holiday in the lovely Villa Sanann in Kalkan. 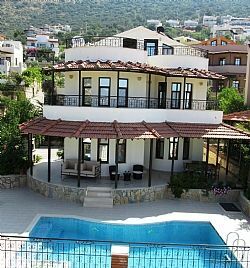 Situated on the hillside it offered lovely views of Kalkan from the roof terrace and the generous first floor balcony. We were a bit worried about the pool being overlooked because the photographs on the HomeAway website do not show the outlook across the pool. We needn't have worried! While there are villas all around you, you have a great degree of privacy. The villa next door lay empty the whole time we were there and although all the other villas around us were rented out, their position on a hill and outlook means that no one will overlook you while you're swimming or sunbathing. The kitchen was well quipped with a dishwasher, cooker, microwave, and fridge freezer. The 3 bathrooms were modern, sleek and clean - two of them could be described as wet rooms and the third as a small en-suite toilet and sink. We found the facilities more than adequate! In fact, the photographs on the website don't do the property justice! In particular, the first floor bedrooms, which are roomy and airy. The master bedroom is a delight. The beds are extremely comfy and we would have slept like kings if it hadn't been so hot. There is aircon but we have a few asthma sufferers in the family, so tend to avoid it during nighttime. Obviously, that was our choice because we could have turned the aircon on! Instead we opened the balcony doors (2 in the master) and the windows to take advantage of the lovely mountain breeze which you get most days. The villa is situated up a hill but we found this to be an advantage: the temperature is more pleasant than further down the hill in Kalkan (the children often commented on the difference when we'd walk into town of an evening for our meal). Taxis cost about £2.50 from the old town or harbour to the villa and we generally just caught one on the way home (laden with bags of shopping, a pram and 6 of us - £2.50 seemed a very good deal!). The walk into Kalkan down a hill, across a footbridge with breathtaking views, past a mosque - is lovely. Within 5-6 minutes walk you reach a main road into Kalkan, where you find supermarkets, shops, restaurants and even a playground! Sandra was lovely and very helpful before our trip, answering countless emails patiently and offering help and reassurance about any worries. So pleased you enjoyed Villa Sanann and Kalkan as much as we do. The villa and location were perfect! Kalkan as a holiday destination is hard to beat. We will definitely be returning and it will be to this villa. The location is ideal, just up the hill far enough to offer a breeze yet close enough to get into town of an evening. There are plenty of taxis around but we hired a car and would so again. The accommodation on offer is ample big enough for a family of five and the individually controlled air conditioning was much appreciated. Communication with Sandra, the owner prior to the trip was great and once there we had a point of contact, Gareth, who always made himself available. The villa was cleaned regularly and the pool maintained daily. No complaints. I would definitely recommend this villa. Many thanks for your comments and so glad you had a great holiday. The villa was exactly as stated, and clean. The owner was extremely helpful and understood all my families needs. I would definitely recommend this to book. Enjoyed the walk down to the village and also the local market held on Tuesday. Turkish local people were polite, pleasant and helpful. We spent 18 nights in villa sanan in Kalkan. Two parents and three children aged 7,9 & 12 all voted this our best holiday ever. The villa was immaculate, the owners really helpful prior to & during our stay and the villa was kept spick n span by the lovely housekeeper. The pool was warm , always in the sun. All appliances made the holiday easy. The town of Kalkan was beautiful. A ten minute down hill walk where amazing quality roof top restaurants all with fabulous views over the harbour.all of the restaurants has wii fii which kept the kids happy. The trip on the boat to the beach club was amazing. Didn't want to come home. Would love to go back and have recommended this villa to lots of friends. So pleased you had a wonderful time. Igna, our housekeeper is an absolute treasure and takes such good care of our villa, as do Gareth and Carys, who are in charge of villa maintenance. Thanks again for your comments. Kalkan beach is approximately 10-15 mins stroll away, or if you prefer, the much larger Patara Beach is a 20 min. dolmus ride. Dalaman airport is approximately 1½ hour's drive. Transfers can be arranged. Kalkan is central to many places of interest which are easily accessible on the local dolmus/bus, or if your prefer, in the harbour there are daily boat trips. There are many local supermarkets catering for all your needs in the village, also the Post Office and several banks. There are numerous restaurants, so many, you will be spoiled for choice.